Green smoothies are a good, good habit to get into. I honestly believe that the more I have them, the more I crave the healthy stuff. I also think they make my skin look so much better. 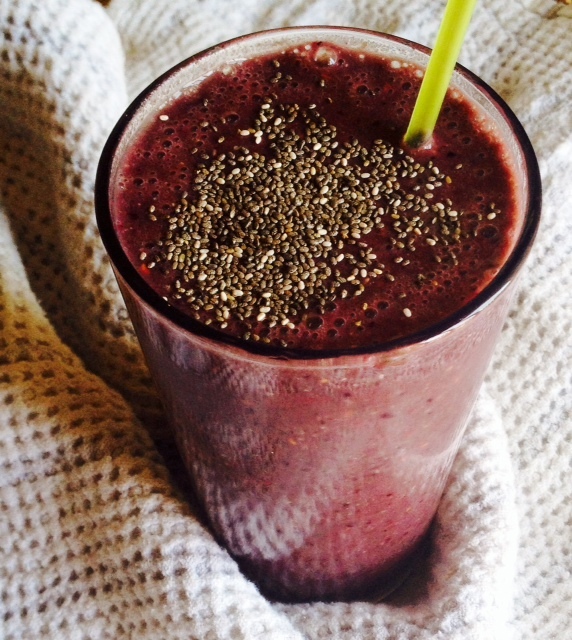 This smoothie is my go-to breakfast and I find if I skip it for even a day, I just don’t feel as good. I can almost feel my body begging for the nutrients and the second I have it, I get a burst of energy. I have experimented with smoothies and juicing for a long time now. I love our juicer and the way fresh juice makes me feel but I can’t deny the cost and the extra work involved. Smoothies are just so easy. I have played around with every kind of milk imaginable but coconut is my favorite. I have also played around with fruits and although I can’t say I have disliked any combination, the one below has been my go-to for the last several months. Blend first three ingredients together until smooth. Add fruit and blend, adding a bit of water if mixture is too thick. Taste and add honey if you want it sweeter (if you use the juice it should be sweet enough already). Once blended and smooth, pour into glass and serve. Notes: I like to swap ½ cup pineapple for the banana on occasion. I also sometimes use a mix of kale and spinach. I am really needing one after restaurant food all week!